The most exalted and revered Dark Angels heroes and the descriptions of their abilities and exploits are recorded within these pages. Walk with devotion and reverance! This section contains additional modifications to existing official special characters. The official point costs and rules are refernced and may be found in the appropriate Codex. 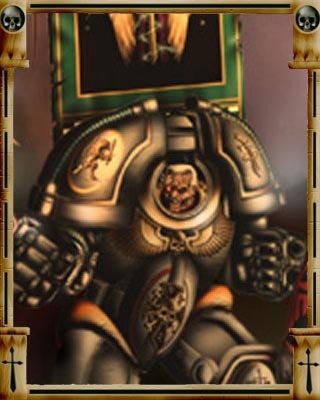 Supreme Grandmaster of Dark Angels chapters with the honorific title Keeper of the Truth. A rare image of Azrael clad in tactical dreadnought armour during his tenure as Master of the Deathwing, circa 918M40. "Hunting the Fallen & Cypher"
Ancient Armour: Azrael wears an ancient and mastercrafted suit of power armour which confers on him a 2+ armour save and a 5+ invulnerable save. It has a built in teleportation device allowing him to deep strike as if clad in Tactical Dreadnought Armour. Ancient Weapon: Made by artisans of an era bygone, the Azrael may use either component of the combi weapon more than once without the risk of an over hear. Azrael is the current supreme grandmaster of the Dark Angels chapter and the unofficial commander ofall the Unforgiven chapters. During the Eye of Terror campaign he personally led the legion strong gathering of the Unforgiven chapters and faced off against Abaddon himself. "And they shall know no fear"